The Judean Rebels completed a successful title defense to defeat the Tel Aviv ‘Hotel Gilgal’ Pioneers in the Israel Football League. 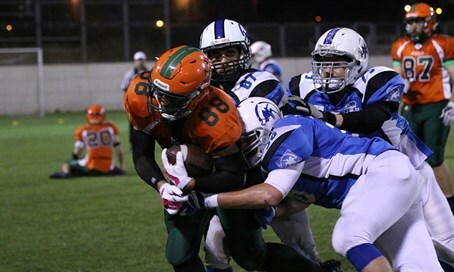 The Judean Rebels completed a successful title defense on Thursday night, overcoming a slow start to defeat the Tel Aviv ‘Hotel Gilgal’ Pioneers 32-14 in front of almost a thousand fans in Petah Tikva. The weather was perfect and it was a great atmosphere for a title game. Tel Aviv started off with a nice drive, capped by a 30-yard touchdown pass from quarterback Ronny Moscona to Nimrod Pintel on 4th down for an early 6-0 Pioneers lead. The Rebels answered with a scoring drive of their own, with two big catches by tight end Cole Kiser, including a 35-yard touchdown reception to tie the game at 6. The Pioneers came back with a 9-play drive that had some nice runs by fullback Noam Dalal, and Moscona found Pintel again for touchdown, 14-6, and that was the score at the end of the first quarter. The Rebels started off the second quarter with a punt, but Rebels’ defensive tackle Uria Loberbom sacked Moscona in the end-zone for a safety to make it 14-8. The Rebels got the ball and went on a 14-play drive that lasted 6:25, and quarterback Dani Eastman ran in a score to take the lead for the Rebels 16-14. The Pioneers were forced to punt with 16 seconds to go in the half, and the Rebels couldn’t get on the board again before the break. The Rebels turned the ball over on downs to start the second half, but the Pioneers were forced to punt after Loberbom and Jeremiah Jelski sacked Moscona on third down. Eatsman lead his offense down the field on a 13-play drive that took the game into the fourth and final quarter, and found Gideon Reiz in the end-zone for a 20-yard scoring pass to make the score 24-14. Pioneers’ returner Cameron Simmonds fumbled on the ensuing kickoff and the ball was recovered by the Rebels’ Avraham Fisgus in Pioneers territory. The Judeans then went on a 10-play, clock-chewing drive, and Eastman ran in another score with 7 minutes to play to make it 32-14. Jelski came up with another 3rd-down sack to force a Pioneers punt with 2-and-a-half minutes to play. The Rebels ended up punting before the game ended, and three plays later the Judean celebrations began. The biggest statistic was the fact that the Rebels ran 61 plays on offense, while the Pioneers only ran 34 plays. Eastman, who received game MVP honors, finished 17/34 for 180 yards and 2 touchdowns, adding 87 yards and 2 touchdowns on the ground. The Rebels, missing star receivers Misha Belov (military) and Chaim Aaron (injury), got a great performance from Gideon Reiz, who caught 9 passes for 78 yards and a score, plus 10 yards rushing. Kiser finished with 2 catches for 53 yards and a score, and Shai Brill caught 3 passes for 30 yards. The defense did not allow any points after the first quarter in the Israel Bowl for the second straight year. Jelski finished with 8 tackles and 1.5 sacks, Ami Notis had 7 tackles (3.5 TFL) and a sack, and Loberbom had 5 tackles and 1.5 sacks, including the safety sack. Moscona completed 5/7 passes for 47 yards and 2 scores, both to Pintel, who had 3 catches for 45 yards. IFL-leading rusher Yuval Fenta was limited by the defense to just 23 yards on 11 carries. Fullback Dalal had a solid game with 22 yards on 6 carries. The defense was led by veteran defensive back Elan Neiger who had 10 tackles, a sack and a breakup. Jason Leos had 9 tackles and Daniel Ben-Zvi had 6 tackles and 2 breakups. The Rebels have now tied the Tel Aviv/Jaffa Sabres for the most titles in Kraft Family Israel Football League history (3), while the Pioneers now hold the record for most Israel Bowl appearances (5). The league is made up of 70% Israelis and 30% Olim, said IFL Commissioner Betzalel Friedman in a conversation with Arutz Sheva.